An unusual French heirloom, Fairytale has a deeply lobed, slightly squat shape and a magnificent mahogany brown color. Similar shape to Cinderella but more deeply ribbed with a thick, strong handle these pumpkins average eight to twenty-five pounds. The flesh is deep orange and suitable for cooking and baking pies. Source: France, Thailand, Costa Rica, Panama, Honduras. Handling: Use a sharp knife to cut the fairytale pumpkin into slices, using the ribs as a cutting guide Fairytale pumpkins can be used in any pumpkin recipe. Their sweet flavor is highlighted well in desserts and used as filling in pies and tartlets. Puree to make pumpkin butter or soups. 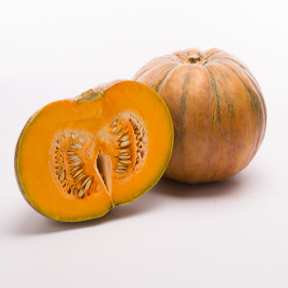 Roasting or grilling will enhance the sweet flavor of the Fairytale pumpkin. This pumpkin can also be eaten fresh.